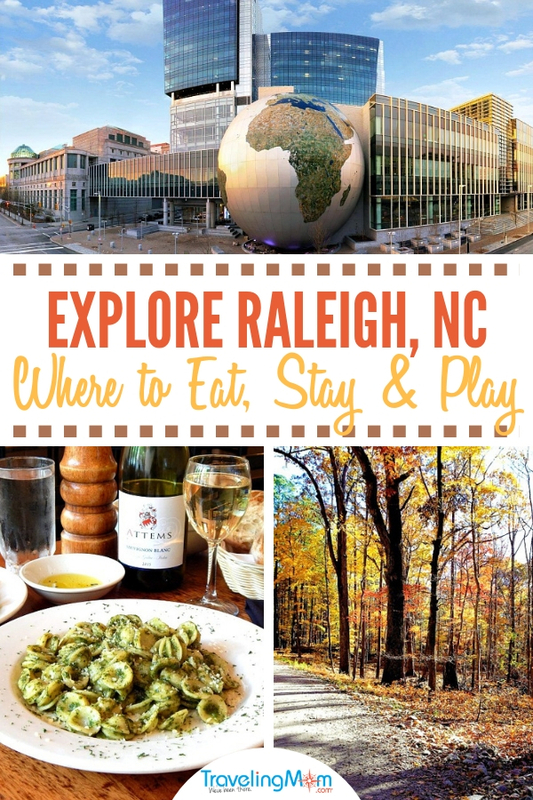 Raleigh, North Carolina, is a stately yet vibrant city that’s fun for the whole family. 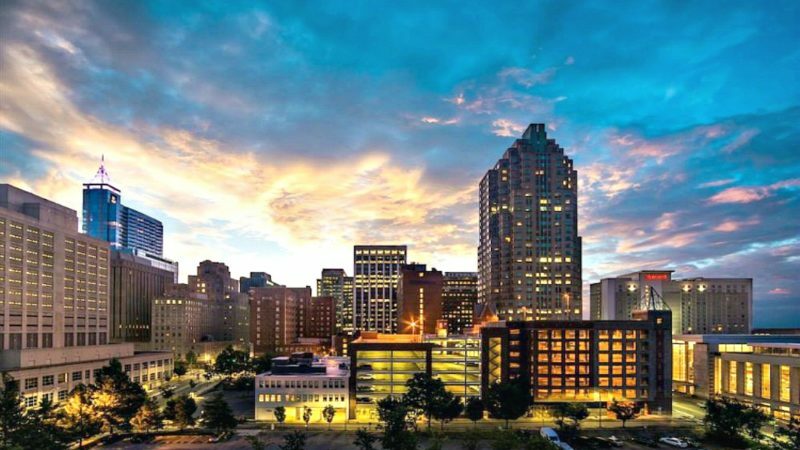 Known to offer a big city feel with Southern charm, Raleigh is a modern-meets-historic destination that definitely succeeds in combining the two vibes. It is a notable vacation spot to eat, play and stay whether you are culturally inclined, the outdoors type, traveling with kids or if you love to drink beer. Lodging choices and places to eat are plentiful and there is something for every budget and lifestyle. 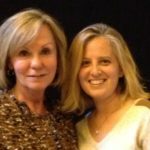 Families of all ages will love the museums, history and outdoor adventures to be found on a Raleigh NC vacation. It was my first visit to Raleigh, but it was immediately obvious that it’s an exciting city. So many neighborhoods have or are currently undergoing gentrification and restaurants abound. In fact one street, Glenwood Avenue, is literally restaurant after restaurant after restaurant. With more than 20 FREE attractions, you can spend the day hopping between the three state museums, wandering the grounds of the State Capitol, seeing historic Civil War cemeteries and meandering along the cobblestone streets of City Market. But with over 150 parks, lakes and green ways in Raleigh, there is also ample opportunity to enjoy any outdoor adventure of your choosing. Unless you are staying downtown, you will need a car to visit most of the attractions and restaurants. Or use a rideshare service like Uber or Lyft. We stayed downtown and our choices of dining options were limited within a comfortable walking distance. The farthest we had to drive was under 10 minutes. To get to more of the outdoor adventures, you will need to drive. 42nd Street Oyster Bar has been an institution in Raleigh since 1931. So, of course, we had to visit. A really large establishment, it is a bit touristy, but a lot of fun. Several great options on the menu are the raw oysters (of which there are multiple choices), Manhattan clam chowder, shrimp and grits, and crab cakes. The restaurant has a commitment to serving the highest quality food and drinks and sourcing local products. When you go by the saying “Seafood Any Fresher Would Still Be in the Ocean,” you have a lot to live up to. 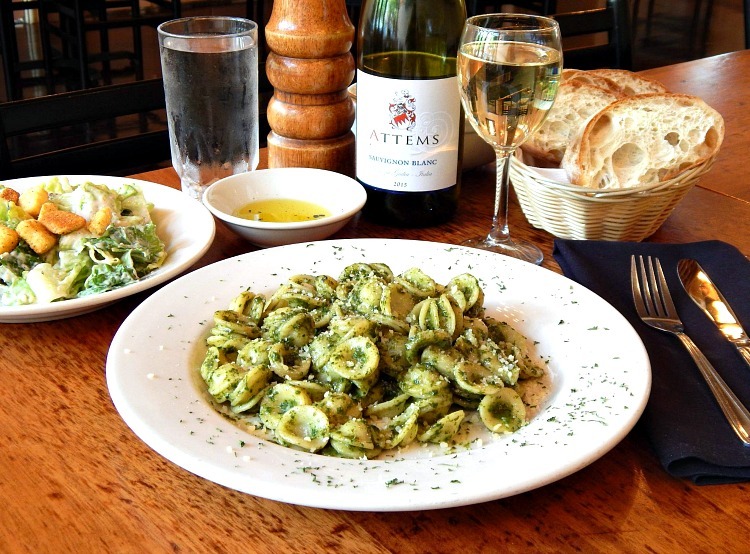 Well known for serving Italian cuisine with a Tuscan flair, Caffe Luna is located in a majestic historic building in Raleigh. It is a cute, homey restaurant with several different dining rooms. You feel like you’re in a house rather than a restaurant. We all had pasta because of Caffe Luna’s reputation as one of the best Italian restaurants in Raleigh, but I’ve been told their salmon is excellent, too. This is one of the restaurants we walked to from our hotel, the Marriott City Center. The restaurant also has a reputation for making you feel like family and, I have to say, the service did feel like this. Great food and ambiance are to be found at Caffe Luna in Raleigh, NC. Photo: Caffe Luna. Sullivan’s should satisfy everyone’s meat or seafood cravings. It is constantly showing up on best restaurants lists and with good reason. With the look and feel of an old world steakhouse, Sullivan’s does not disappoint in any aspects. The menu covers a lot of favorites including filet mignon, lobster, burgers, soups and salads. The side dishes are equally impressive. They were even very happy to accommodate this vegetarian. Housed in a repurposed, historic coastal train depot, 18 Seaboard is a top-rated Raleigh restaurant. 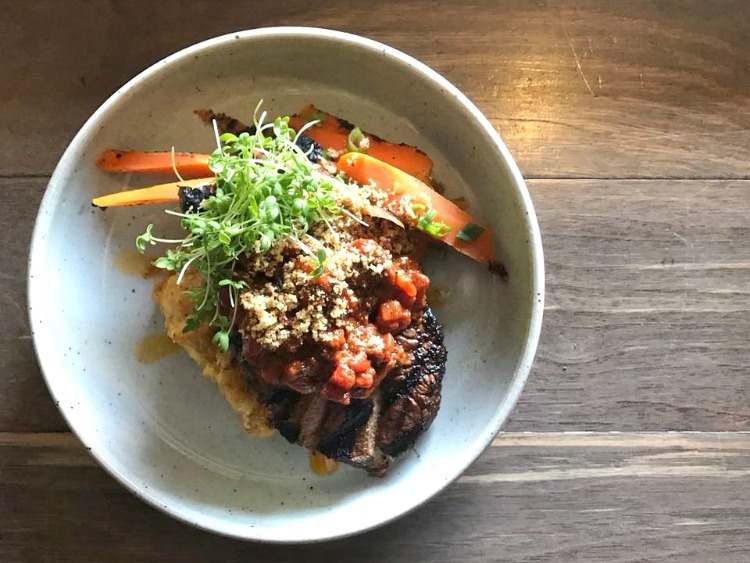 They are committed to serving contemporary Southern-inspired dishes with over 60% of ingredients sourced from North Carolina farms, ranches, fishmongers and dairies. Some of the most popular dishes include cheese grits, fried green tomatoes, catfish, salmon and brisket. Plus, the ambiance was really pretty with brick walls, soft lighting, high ceilings, and modern touches. They also have an excellent bar in the front of the restaurant. Located in the historic Moore Square Park in downtown Raleigh, Asian-inspired Brewery Bhavana has to be one of the most unique concepts for a restaurant. It’s a four-in-one establishment: part brewery, dim-sum restaurant, bookstore and flower shop! And apparently it’s a concept that caught on as it earned a spot on Bon Appetit’s list of America’s Best New Restaurants. I’d highly recommend reservations as I tried to get in several weeks before we were going and they were fully booked for dinner. Maybe try lunch instead. But I had to pop in to satisfy my curiosity at what a four-in-one concept restaurant looks like. I have to say I’d want to go just for the ambiance. It’s a really pretty, ethereal-type atmosphere where you just want to linger. And you can eat in the flower and book shops under skylights and by fig trees. They also own the Laotian restaurant next door, Bida Manda. While it is vegetarian, The Fiction Kitchen is regarded as one of the best restaurants in Raleigh. It’s known to offer great food that you don’t have to be a vegetarian to enjoy. Some of the favorite dishes include Eastern NC Styled BBQ Pulled “Pork” and Crispy Fried “Chicken” with Waffles. Of course, it’s mock chicken! Fiction Kitchen is located in the really cute Warehouse District of Downtown Raleigh. This gem which serves breakfast, lunch and dinner is in downtown Raleigh. It was located across from our hotel, so we ate there a lot. What I love is that the restaurant is committed to serving 100% organic, plant-based dishes and celebrates living foods. They believe that preparing food is a labor of love and that health, beauty and art can be served on a plate. Featuring a bright, open space with an open kitchen, you can eat in or get food and drink to go. They also serve wine and beer. Not expecting much out of a local history museum, we ended up spending several hours taking everything in. The museum preserves local, state and regional history. One of the more popular permanent exhibits, The Story of North Carolina, traces life in NC from its earliest inhabitants through the 20th century. You can see stone tools dating from 12,000 to 1,000 BC, a real cannon from the pirate Blackbeard’s flagship, a full-size replica of the 1903 Wright Flyer airplane, a lunch counter from the Civil Rights Movement and much more. We saw a fascinating, interactive exhibit on World War I complete with videos, bunkers and artifacts from the war. But what was probably most fun was the NC Sports Hall of Fame featuring exhibits and memorabilia from multiple sports. Bonus? The museum is FREE. Talk about impressive. The North Carolina Museum of Art is amazing. 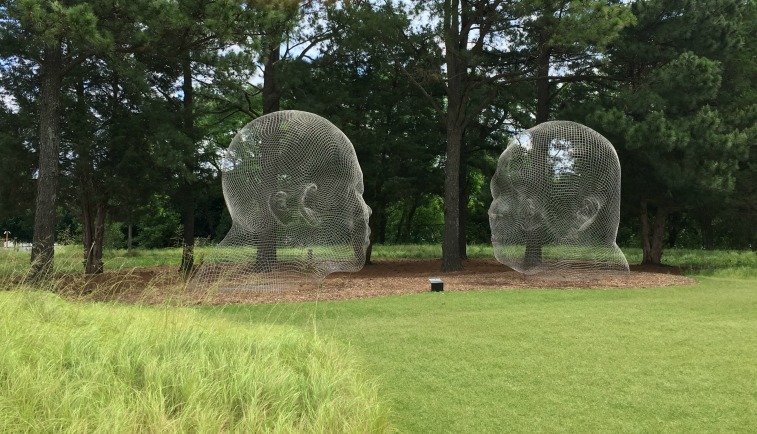 One of the premier art museums of the South, it features not only a world-class art collection, but an outdoor park with works of art, trails, and a live music venue. The permanent collections include ancient Egyptian artifacts, renowned European Old Master paintings, African and Judaic works of art, a huge collection of sculptures by Rodin, along with innovative contemporary art. Don’t miss this one. Admission is FREE, but you can drop some dollars shopping and dining while visiting. There are no permanent exhibits at CAM, but when we visited, there were 3 special exhibits. Painting the Roses Red by Margaret Bowland kept us enthralled while we read the detailed description and inspiration for each painting by the artist. The Long Sun by Anne Lindberg was a unique visual experience. The museum is known for its cultural experiences, and bold, non-traditional exhibitions by living artists. After visiting the museum, we headed out for a walk in the area, called the Warehouse District. Happily, we came across a wine bar/art gallery, Vita Vite, and ventured inside. Of course, we had to stay for a drink and were persuaded by the bartender to try the Frose. Guess what is my new summer drink? It’s essentially a rose wine slushy. Raleigh has more concert dates, venues, bands and genres that any music fan can hope to enjoy. Visitors can find a show every day of the year at the large-scale arenas, such as Coastal Credit Union Music Park at Walnut Creek and Red Hat Amphitheater or at smaller or mid-sized concert halls such as KINGS or The Pour House Music Hall. 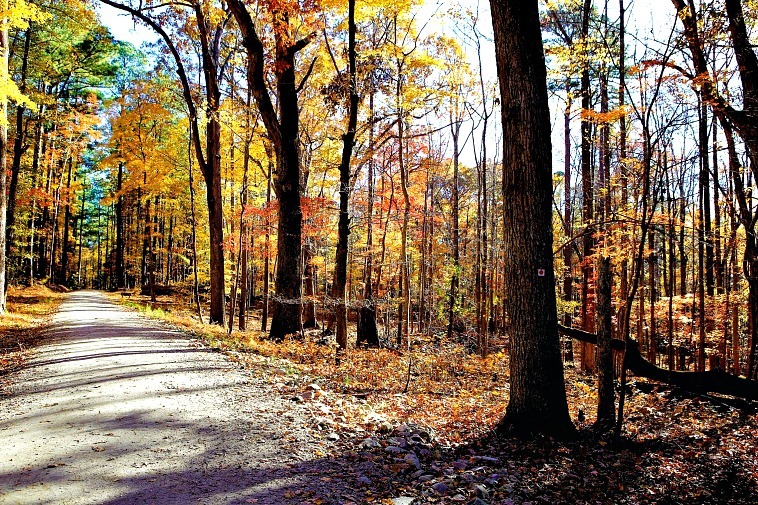 Located only 15 minutes outside of downtown Raleigh, this park is a haven for outdoor lovers. You can use 22 miles of hiking trails, 13 miles of bridle or mountain bike trails, camp, fish and paddle all within the nearly 6,000-acre urban recreational area. You will also be happy to share your outdoors experience with an abundance of wildlife! If indoor rock climbing is more your thing, then the state-of-the-art indoor climbing, fitness and yoga center, Triangle Rock Part, is a must visit. There are locations in North Raleigh and Morrisville, which has the largest and tallest climbing structures in the surrounding five states. It also includes 100 climbing lanes and walls spanning to 55 feet. They have dedicated youth programs and kids 4 and above are welcome. Bike a 5.9 mile trail from the NC Museum of Art through several parks and the campus of NCS University before you finish in the heart of the city. This will give you a great view of many city sites as you get a little exercise. Raleigh has it all from baseball to hockey to professional soccer. Plus, with multiple universities including North Carolina State, you have tons of options to choose from. While we were visiting, national baseball championships were going on, a dance competition and an Ironman triathlon. 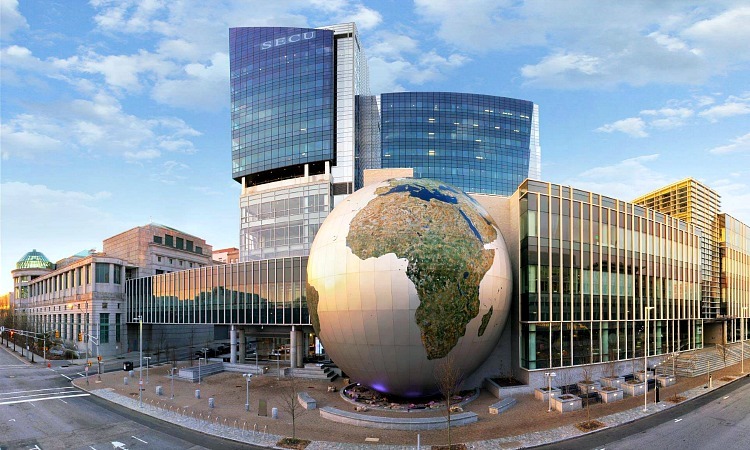 The North Carolina Museum of Natural Sciences is the Southeast’s largest natural history museum and North Carolina’s most popular attraction. Your kids will be thrilled. 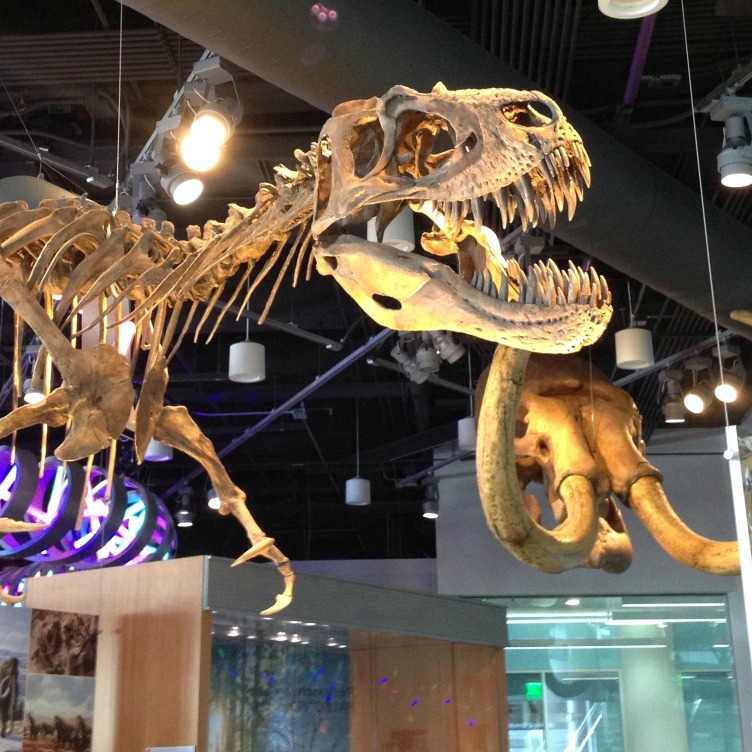 Not only does it have a Nature Exploration Center and Nature Research Center where you can watch research scientists and get inspired by the field of study, but you’ll find four floors of exhibits, live animals, gift shops and cafés. And if that wasn’t impressive enough, it’s also an affiliate of the Smithsonian Institution. Oh, did I mention it’s FREE! The kids will love spending hours in Pullen Park and so will you. With its amusement rides, kiddie water boats and “Andy & Opie” statue, the first public park in NC hosts thousands of visitors throughout the year. The Gustave A. Dentzel Carousel was originally installed in 1911 and is now listed on the National Register of Historic Places. From the world’s first and only kid-driven smart power grid to hands-on STEM learning stations, Marbles educates and inspires children. The museum offers themed exhibits designed to build imagination through self-led exploration of new ideas and experiences. Furthermore, you can also take in a movie at the Marbles IMAX, boasting North Carolina’s only 3D-capable giant screen. The Raleigh area is home to over 25 breweries. From Wake Forest to Raleigh to Holly Springs and Fuquay-Varina, barstools await you. If you like giving a variety of breweries a try, the Raleigh Beer Trail is designed for you. You can take your own brewery tour or one of them provided FREE by the breweries, so you’ll sound like a beer connoisseur when you get home. 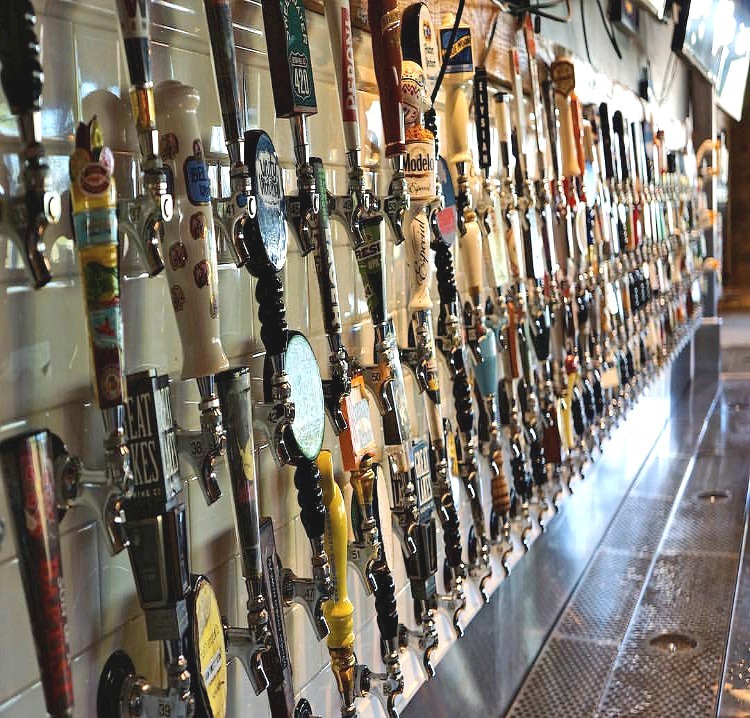 With more than 350 beers on tap, the Raleigh Beer Garden has the world’s largest beer selection, made official when representatives from Guinness World Records visited in 2015. Located in downtown Raleigh’s Glenwood South entertainment district, the venue has a rooftop garden perfect for a warm-weather hangout. And if you’re hungry, they offer a full dining menu. It’s impossible to try all 350 beers at the Raleigh Beer Garden, but it’s fun giving it a go! Photo: Raleigh Beer Garden. While you do have many options of where to stay, here are a few favorites in downtown Raleigh. All are very similar in terms of amenities offering restaurants, indoor pools and fitness centers. The Marriott is a bit more expensive than the other two; you get a complimentary breakfast at Hampton Inn. Since locations are all similar, you may want to book based on reward programs you belong to or your budget. Marriott City Center – We stayed at the Marriott during our visit, so I can personally recommend. The Sheraton – This hotel recently went through a major room renovation and is just steps away from the Marriott. Hampton Inn and Suites – This one is located on Glenwood South amidst the bars and restaurants, but is a short walk to explore the city center’s attractions. What do you love about Raleigh?